Can’t fault Avonpark Village lifestyle. 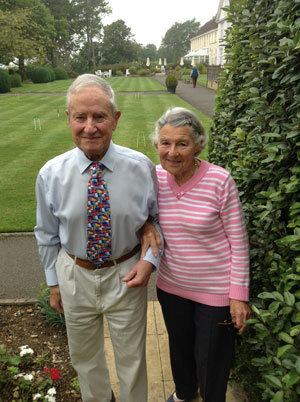 John and Elise Hardwick moved into their two bedroom retirement apartment at Avonpark Village in Winsley in summer 2013. “I have to say I can’t fault a thing,” says Mrs Hardwick, 83. The Hardwicks moved just a hop away from Midford Lane when John was diagnosed with Alzheimers and the couple decided they needed to have a support network in place, just in case it may be needed in the future. At present, they are simply loving their new lifestyle which recently included a village party for family and friends to celebrate their 60th wedding anniversary. “It was a wonderful occasion, we used the village hall and the chef laid on a beautiful spread for us. We had great fun,” added Elise, who together with John, 84, have three children and six grandchildren. The couple bought a two bedroom apartment overlooking the village’s croquet lawn. The apartment also comprises a study, two bathrooms, sitting room and a newly-fitted kitchen. “What we like is the fact that we have our own space and complete independence here and we can cook for ourselves if we want to, but we also have the village restaurant available to use with a first class chef,” added Mrs Hardwick.